Show off your strength and speed with Drop Zone’s Ninja Course. 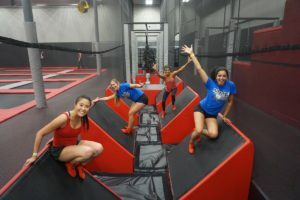 This exciting 1100 square foot “Ninja Warrior” Course is an indoor obstacle course complete with angled steps, slack line with ropes, net bags, cargo nets, cliff hanger/rock wall, challenge rings and the big finish – the mountain climb! Want to challenge a friend or family member? Ask the court monitor to time you and see who can complete the course in the fastest time without falling off. Do not go until the court monitor says it is okay to do so.